Games involving food are typically a big hit, especially with large groups or at events involving children. If you're planning an event, there are a few food-related games that are always a wonderful crowd-pleaser. Chubby bunny only requires a bag or large-sized marshmallows. In the game, all players sit facing each other in a circle. Each player is handed a single marshmallow and is asked to put in inside his cheek and say "chubby bunny." If a player laughs, then she is eliminated from the game. After each person in the circle has had a chance to say chubby bunny, the remaining players are given an additional marshmallow and asked to again say chubby bunny with two marshmallows in their mouth. Players continue putting marshmallows in their mouths until only one player remains.The game requires adult supervision, and should only be played by older children. 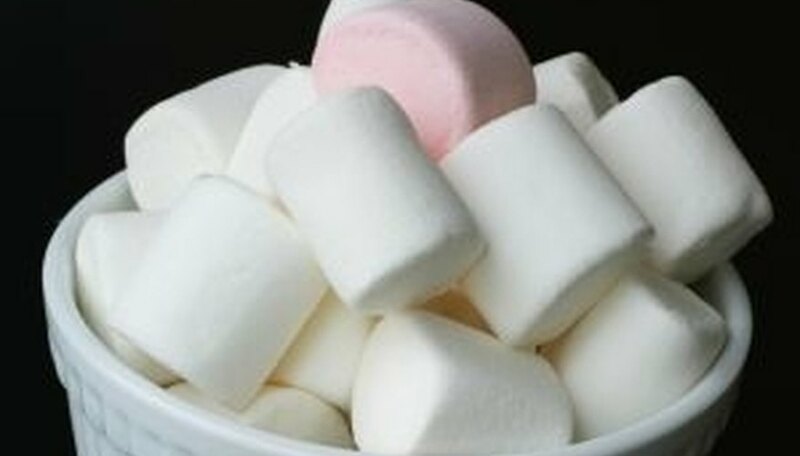 Two deaths have occurred in the U.S. from playing Chubby Bunny due to airway constriction or choking. An old-time favorite, bobbing for apples simply requires you have a large bucket of water and a lot of apples. Players put their hands behind their backs and attempt to get an apple out of the bucket using only their teeth. Much like bobbing for apples, doughnuts on a string requires players to eat a doughnut without using their hands. You tie doughnuts on strings from a clothes line or streamers, and players put their hands behind their back and try to eat the doughnuts. Try using powered doughnuts for a fun-to-watch mess. Place unique pairs of candy on a table, covering each with a cup. Much like traditional memory, each player can turn over two cups, and if the candy underneath matches, then they can take the candy away. If it does not, they must return the cups and allow the next player to attempt to find a match.